A full year experimental biology course that covers all the general biology requirements of student-designed experiments. 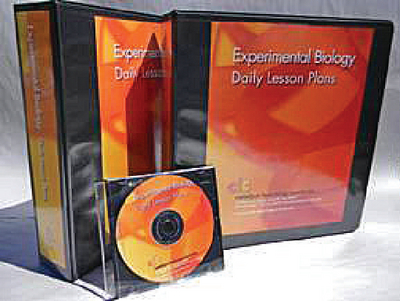 Daily lesson plans introduce each concept through a demonstration, lab or engagement activity. Students formulate their own scientific questions before designing and conducting their own scientific procedure. With over 20 lab and field experiments, students gain experience in data collection, graphic and analysis. By modifying and improving their procedures based on peer review feedback, they ensure their work is conducted within parameters of the highest quality scientific research. This curriculum exceeds requirements for all states as well as preparing students to gain college-level critical thinking, writing, and analysis skills necessary for any AP® or university course. The coursework includes games, simulations, modeling, puzzles and case studies enabling students to learn about scientific processes in a fun and memorable manner with the single objective of scientific literacy as the goal. The course is available in a printed format (two three-ring binders of approximately 790 pages total) or on CD (Adobe PDF files for PC or Mac). Each curriculum is a single-user license and includes a one month free subscription to the on-line community where additional activities, videos, data sets, photos and other support materials are posted by CLC and teachers who are using this curriculum.